Chris Harris rode well for Panthers at Sheffield, but misses tonight's (Friday) meeting with Berwick. 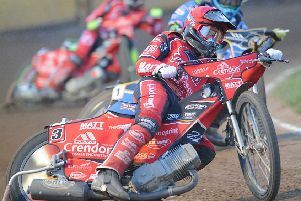 Team boss Carl Johnson insisted he has full faith in his Peterborough Panthers riders – despite a second defeat at the hands of SGB Championship rivals Sheffield in the space of five days. The city team now find themselves a whopping 15 points off the play-off pace after going down 51-42 at Owlerton Stadium last night (June 22). They also lost 48-45 to the Tigers on home shale at the weekend. Jack Holder was again in top form for Panthers at Sheffield. Red-hot Jack Holder and number one Chris Harris again contributed the bulk of Panthers’ points in South Yorkshire. Holder grabbed three heat wins on his way to a 12+1 haul, while Harris finished with a 13+1 return boosted by a successful tactical ride. That double-points mission in heat 11 led to the first of Panthers’ two advantages as Bradley Wilson-Dean’s third place clinched a 7-2. Wilson-Dean was the only other rider to win a race when taking the flag in heat eight. But Panthers’ fate was already sealed by the time their top duo combined for a 5-1 in the finale when Holder led in Harris. Johnson stressed: “Everyone is giving it their all, but it’s not happening for us at the moment. Rory Schlein guests for Panthers against Berwick tonight (Friday). “We could have beaten Sheffield at home last Sunday - and we weren’t far away again at their place. “We’re in a situation where we’re not winning enough races, but are picking up too many last places. Panthers were on the receiving end of 5-1s from Sheffield in heats three, five and 10 as they fell into arrears of a dozen points. They hit back when Harris donned the black and white helmet colours for his tactical ride in the 11th contest, but Sheffield immediately responded with a 4-2 in heat 12. A shared 13th race confirmed the hosts’ victory and Panthers saw their hopes of snatching a consolation point end moments later. Skipper Ulrich Ostergaard crashed out of the penultimate heat with a snapped chain to complete a torrid night in which he only managed one scoring ride and two points. Partner Tom Bacon was powerless to prevent a Sheffield 5-1 in the re-run before Panthers ended on something of a high courtesy of the exploits of Holder and Harris in the closing battle. Panthers have a quick chance to return to winning ways when hosting rock-bottom Berwick at the East of England Arena tonight (June 23, 7.30pm). They beat the Bandits 54-38 less than a fortnight ago and are in desperate need of another triumph. Club chiefs have called in Australian star Rory Schlein – who finished on the podium in the British Final earlier in the week – to guest at number one with Harris on SGB Premiership duty. Schlein was third in the national championship after being allowed to compete due to riding on a British licence. He’s also been in fine form for Ipswich in the SGB Championship and top-flight side Wolverhampton. “We’ve got to start winning meetings and putting points on the board,” added Johnson. “We know the league position is far from ideal, but our focus needs to be on the track rather than the table, and we need the fans to stick with us. SHEFFIELD: Josh Bates 10+2, Lasse Bjerre 10+1, Todd Kurtz 8+2, Kyle Howarth 8, Josh Grajczonek 8, Rob Branford 7+2, Andy Mellish (guest) 0. PANTHERS: Chris Harris 13+1, Jack Holder 12+1, Bradley Wilson-Dean 5+1, Paul Starke 5+1, Tom Bacon 3+2, Ulrich Ostergaard 2, Richard Hall 2. PANTHERS: Rory Schlein (guest), Bradley Wilson-Dean, Paul Starke, Ulrich Ostergaard, Jack Holder, Richard Hall, Tom Bacon. BERWICK: Nick Morris, Joe Jacobs, Dany Gappmaier, David Howe, Kevin Doolan, Jye Etheridge, Alfie Bowtell (guest).